A few days ago I published my introduction to the Niche Site Duel which was originally started by Pat and Tyrone. See the footer of this article for the hub of all niche site duel participants. In my intro post I discussed how my main keyword is a low traffic low competition keyword and that it should be a springboard to a better keyword if I play my cards right and work hard enough and long enough at it. The main keyword I’m targeting is 4 words long and it has low competition on page one of Google but it also doesn’t really have a lot of searchers for it according to Google’s Adwords Keyword Tool. Additionally the tool also shows that the CPC for the keyword isn’t all that high although it is around $2 which isn’t that bad. What I’m going to be relying on to make money on this niche site at first is the long tails. When I get to number one for my main keyword that will be nice but the long tails are generally where the money is at when it comes to having a better CTR and better conversion rates. To get all the long tails I can I decided to write one insanely long post which was just shy of 3,000 words. In this one article I have pretty much covered everything relating to my keyword and have included as many variations and synonyms to my keyword as possible. This should help a lot in bringing long-tail keywords out of the wood-works once this article gets ranking. Initially I plan on getting this new site to rank by throwing some backlinks at it but unlike some others my plan is to build backlinks to this article slowly and only from higher quality sites and sources. I will not be using automatic mass article creation software but instead will do everything manually. It is my opinion (I’m still to new at this game to be positive) that higher quality links from more relevant sources are the best way to rank a website and get it performing well. This is not to say that other techniques don’t work but for now these are my values. I’m after search traffic first and foremost. This is where the money is so I don’t care about social traffic. The only thing I will do is post articles online looking for high quality and relevant dofollow backlinks. To start off I have written a second fairly long post on the site on “The Best Socks for Diabetics” and used it to link to the main blog front page. Each article has its own category and each has approximately 6 tags. And every page links back to the main page. This is a standard site structure but remember that the more pages on your site you have linking back to the home page the better the home page will perform. Internal linking is very important. Because it is important I will continue adding posts to this site just for the internal links even though initially I won’t be trying to rank the interior post pages. My first course of action after initially building this site is to get a few high quality backlinks to it from relevant pages. 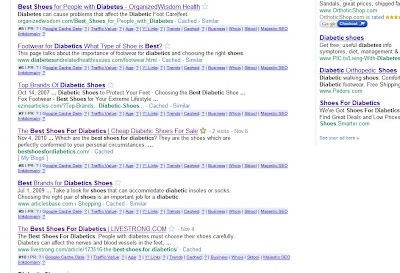 To do this I wrote a long and helpful post in InfoBarrel titled “The Best Shoes For Diabetics” which links out to the website once in the last paragraph of the article. I did the same thing over on HubPages with my article titled “The Best Cheap Diabetic Shoes For Men” and over on Snipsly with my article titled: “The Best Socks For Diabetics”. The point here is that these are web 2.0 properties which have the potential of making some money right away which will help compensate me for my time while I wait for the new website to start ranking well. Each site makes money via Adsense and HubPages and InfoBarrel can make money for me via Amazon. In fact my IB article has already made me $0.49 already making this project already generating cash flow. Currently I have three good articles backlinking my new website and now I want to make sure these three articles are authority pages so I’m going to backlink them to make sure they are indexed and well crawled by the Google bots. 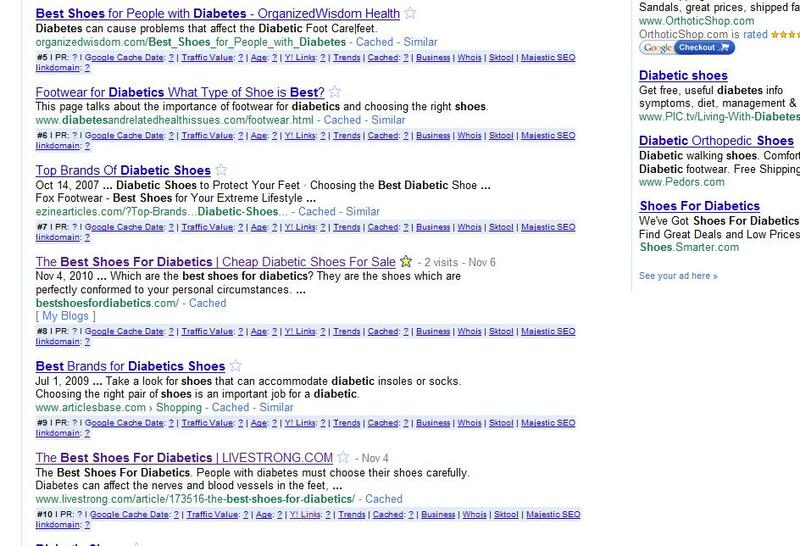 For my IB article I went back to four previously published articles on diabetes and shoes topics which I wrote a long time ago and added internal links to the IB article. In another couple days I will do that again with four more articles and then again a few days later. Eventually I’d like to have a good 15 or so internal links to this IB article pushing good authority to this page. I will do the same for articles on Snipsly and on HubPages however this won’t be as effective for me over on those sites because I don’t have as much content published to pull internal links from. After focusing on internal linking on my main supporting sites I want to continue building the authority of these three main supporting backlinks to my main site by doing a little article marketing on them. I will use a couple dofollow directories which I know are high quality. Ezine is one and it’s one everyone has heard about and the other is Posturown.com which is a quasi-revenue sharing site/group blog / article directory which I know from personal experience does really well at getting indexed and passing good juice onto pages it links out to. I have yet to take this step but that’s what the rest of the day and tomorrow is all about. Once I get some good links to my IB article I will do the same for the HubPage article and for the Snipsly article. The goal is to get all three ranked decently and with minimal page rank so that I can be sure they are sending good authority on to my main site. In addition to this plan I will be taking the easy way when it comes to social bookmarking (which I feel has limited value even when you take your time and bookmark manually) and will be relying on IMAutomator, a free automatic web-based social bookmarking program to send bookmarks to my main site page, my three supporting backlinks over on IB, HP, and Snipsly, and most importantly to my arsenal of article marketing articles which are used to build the page rank of the main supporting backlinks. IMAutomator does the bookmarking in a drip system so that I don’t flood the sites with links all at once and should help out at least a little – in my opinion this may not be necessary but doing it automatically takes little to none of my time so I’ll give it a whirl. This week I plan on adding a page or two more of long and detailed content to the main site but mostly it will be devoted to building the authority of my three main supporting pages on IB, HP, and Snipsly. I believe that by next Sunday I should have made at least a few more dollars on this project just on those three sites… I haven’t even added monetization to the main niche site yet so that may come by next week as well. Right now I’m planning on mixing Adsense and Amazon as my main ways to monetize the site but eventually I want to explore some more obscure affiliate programs with medical shoes and diabetic supply companies. I haven’t explored this route yet but plan to in the future when things are starting to hum along. As of now my niche site has been live for about 3 ½ days – I have ten results indexed for the website – I’ve made $0.49 from this project via Adsense on InfoBarrel. Ohh yeah, and my main keyword is already showing up on page one of Google in the #7 spot. Crazy! See here for the Niche Site Duel Hub and all the participants in this challenge. Make sure to click through and visit their sites as there is a lot to be learned from everyone! I took a look at your best shoes for diabetics site. A constructive comment I'll share is that I read through the article (did not watch the Yuotube video) and then said "what now?" The ads are all up at the top of the page, as are the links to the other article(s). Even the affiliate links to Amazon are off the page when you get to the bottom. The really long article is great but it leaves the reader hanging with nothing logical to do but hit the back button at the end. Thanks for the tips on Share-A-Sale - I have been planning on looking around for some good affiliate programs but haven't made that a priority yet - I figured I'd work on getting ranked and slowly build up the monitization of the site first. I want to see if I can get some blogroll exchanges and don't want to go overkill on monetization or Affiliate linkage while I try to score some of those exchanges. Also you may not have noticet but none of the links to Amazon are even affiliate links yet so I haven't included many of them. I haven't setup my tracking code yet. :) All things in time - maybe today. Restricting outbound links to links that make you money will be important. Reciprocal links to other sites are non-revenue links, so consider if you really want or need these links to get the authority you need. My experience with Amazon links is they have very poor sell through, but this is a different niche. Together Analytics, Adsense and Amazon can track where your visitors are exiting. It would be interesting to see if no Amazon links = more Adsense clicks and vice versa. Also compare to direct affiliate links. Which will have the biggest payoff per thousand visitors? Jade is correct - limiting outbound links to only money links is a good way to maximize earnings but you should probably have some credible outbound links on your site... which is why I have a few quality resources linked to in the sidebar. When I get to doing blogroll exchanges I will be doing three way exchanges to avoid reciprocal linking too... I just don't want to blogroll exchanges until the site is more established. I've found that depending on the type of traffic Amazon links work pretty good. Most people finding this site in search engines will be in a buying mode so I expect thee links to fare well over time. I will be monitoring them closely though to maximize their placement and the link text I use. In the future I will do a post on my monitization methodology as it is a little more complex than just putting links and Adsense up there. This early on I need to get traffic first so that's a priority over optimizing the ads and affiliate links.